What Myanmar tells about Buddhism . . . .
Of course Buddhist believes in Buddha and you can see the symbol or replica of Buddha in Bagan like no other city or country. Bagan is the proof of us believing much in Buddha. 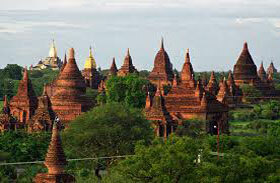 I do think that Bagan is bigger in terms of square meter and temples than Siem Reap, Cambodia and Ayuttaya, Thailand. I might be wrong though. So basically, what does Bagan could offer except the vast ruined plain. There are stories in the ruins. One good example would be Dammayangyi Temple. A temple built by a king advised by palace astrologers to cure the Headache. His passion of making this temple one of a kind made him a killing machine. Yep, that's the word killing machine. He killed his father. He killed the architects who built Dammayangyi. He killed other people until he was killed by one of his queens. When I visited Dammayangyi, I tried to know him better by the building he donated. Local Guide there would be a medium to bring you back to the era of Ancient Burma's first monarchy. They are the story tellers. But do not get caught up in absorbing too much information while you are there. Enjoy the toddy palm liquor with the guide. It's more fun to mingle with locals in stead of having them stood at the side like a Wikipedia. You know it's true. Your trip would be damn boring if you treat your guide like a Wikipedia.